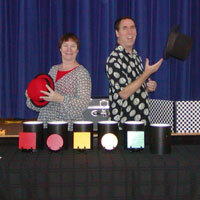 Leslie and Jay Cady use mime and juggling to help little nippers learn basic concepts they need for kindergarten. Students are led through a mime alphabet acting out mime illusions from A to Z. Jay and Leslie juggle props of different shapes and colors and challenge the students to count them, recognize repeating patterns, and complete sets in accordance with math standards set by the National Council of Teachers of Mathematics for pre-kindergarten through first grade. Fees: $251 single, $424 double / The break between performances must not exceed 90 minutes to receive the reduced rate. Title 1 Schools may qualify for funding assistance. Requirements: 100 students maximum per performance; please note that this is a 30-minute program; requires two 6' tables. Teachers must be present at all times during performance.